Cream Shell - Loft $?? I think $15ish, it was a loong time ago. Yesterday, Mel asked about some the deals I find at Talbot's, so I wanted to take a sec and answer. I do almost all my shopping online. I wear the 12WP in tops and jackets and they actually do not usually carry that ONE particular size in the stores (go figure). One thing I like about them is that items online, and in stores are almost always priced identically, and its rare that they offer a sale that applies to online only or in store only. At any rate, Talbot's adds a new catalog monthly, and puts items from the 2-3 previous catalogs on sale. It seems the first markdown is usually between 20-40%, give or take. A few times a year they have a "Red Hanger Sale" where the prices are marked down a touch more, maybe 10-15%...However, sometimes during holiday weekends, and halfway through the red hanger sale, they offer an additional 40% or 50% off the sale prices. This is the clearance gold. Its temporary and they do put the prices back up afterward. I always post when that is on - but be warned - its super easy to find a cartload of stuff that is in the $15-$25 range. I always have to do a reality check (for example: Am I REALLY gonna wear a paisley blouse?) ....Recently, they did this over President's Day. So, just keep your eyes peeled, since I check Talbots REGULARLY (ha! ), I usually post about the sales before the emails go out. Thanks for the question, and I hope this helped! oh my god! The zebra scarf is so darn cute! I love the scarf. I want it!!! I love your blog! How do you find the Loft items so cheap? Do you order online or buy these items in the Loft stores? I love your outfits! 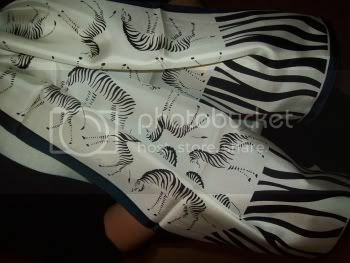 The zebra scarf reminds me of a drawing, it is very beautiful. You shop with a method, I see. Thank you guys, I love the zebras as well. Darla, thanks for the note! I responded in today's post. Sorry that took so long!! Love the zebra scarf. Zebra stripes are so in and you've shown that they don't necessarily have to be in the form of a top or jacket. Lovely. This is soo funny. I love Talbots scarves too! They are great when they are on sale, they look soo expensive and chic! You look great!